Great Questions as a gasgas trials bike owner I rode the contact and it is a great buy for someone new to modern trials bikes . The bones are all trials bike the parts are great for someone who does not need the suspension a Race version gives you . The seat tank combo gives you a Sherco Xride type of trail bike , I have one of those to and it just does not get used much . The engine and power are great for trials events and messing around the back yard . I do not know of a better buy out there for a starter trials /Xride bike . Good luck if you do get it . PM me if you have any questions . I really like my gg trials bikes and have owned a bunch of brands . The contact is the TXT bikes with bigger tank and added seat. It has cheaper suspension (oll? front forks), and other equipments whitch give it smaller price point. Same engine and frame. My son and I were looking at the Contact today and if I did not own a Sherco X ride as my third Trials bike / with a seat I would buy one . They are a copy of my 2014 Factory with a few changes that up to killer intermedate / expert you would not no the difference . I would change out the tires at some point with a better tire and put in a tubeless tire setup . And that is it just ride it!! Mattos had two on the floor . Throw my 2 cents into this discussion. Keep in mind I?m an average off-road rider at best and been riding since I was 8, but this trials game is all new to me. Sure I've ridden them before but only now am I taking the serious approach to learning how to ride with finesse, and considering competing in the STRA series next season. Since I have both TXT280 and Contact 250 in my demo fleet, and after spending a bit of time on both, I offer the following impressions. First the upside on TXT 280 Racing. TXT has power, and lots of it. Simple blip of the throttle puts the 280 from wheel pointing skyward. Combine that kind of punch with the right amount of body English, there isn't much you can't climb or jump over if you have the guts to try it. Top of the line suspension, wheels, tires, controls, clamps, etc for only MSRP $7699 USD and you have a machine capable of winning the local trial or a National. It's all up to you and your skill level. TXT has power...and sometimes too much of it. Hard to hang on when you're a novice trials rider (or at least for me), learning the ropes on a world champion caliber machine. In some cases, I approach an obstacle, close my eyes, blip the throttle and hope for the best. The bike has never failed to get the job done, making me look like a hero but if I'm not extra careful with all that power on tap, I get into trouble when I should be smooth. You have the option of a dual map switch and yes, it makes a world of difference. Regardless, the TXT 280 Racing is a serious machine designed for a rider with ALLOT more talent than I will ever have. Contact 250, the plus side. Contact comes with a Dellorto carb and surprisingly it starts easier than TXT which uses a Keihin. Power delivery is VERY user friendly, with bottom end torque that allows me to ride extra smooth over the rough stuff. Clutch and brake action are typical GasGas...top notch. The larger fuel tank allows for a longer ride, without sacrificing handling because of the extra fuel and suspension works pretty good, even at my weight. The minus side of Contact. The tires are OK at best. If you never ride a bike that has a good pair of real trials tires mounted on it, then you'll never see the need to change them. OK, I'll be honest. The stock tires will get you by if your only riding novice sections or trail riding but don't think for a second these will stick on a wet rock like the Michelin X11s that come stock on the TXT. Keep in mind also, the TXT rims are tubeless while the Contact is a tube type. Power is very good for the novice / intermediate rider but you will need to stab the clutch lever PLUS blip the throttle to clear the same obstacle that TXT just went over like it was nothing. Out on rougher portions of trail, the Contact front end feels just a tad heavy compared to TXT. Once again perhaps because of the power delivery but mostly because the front fork is a bit soft compared to the higher quality forks used on TXT. OK, so round it off at $1700.00 difference and ask yourself this. "How serious do I plan to get with a trials bike?" Simply put, you can't buy a Contact and turn it into a TXT with $1700.00. Not even close. All things considered, the TXT is the true bargain of the 2 bikes. 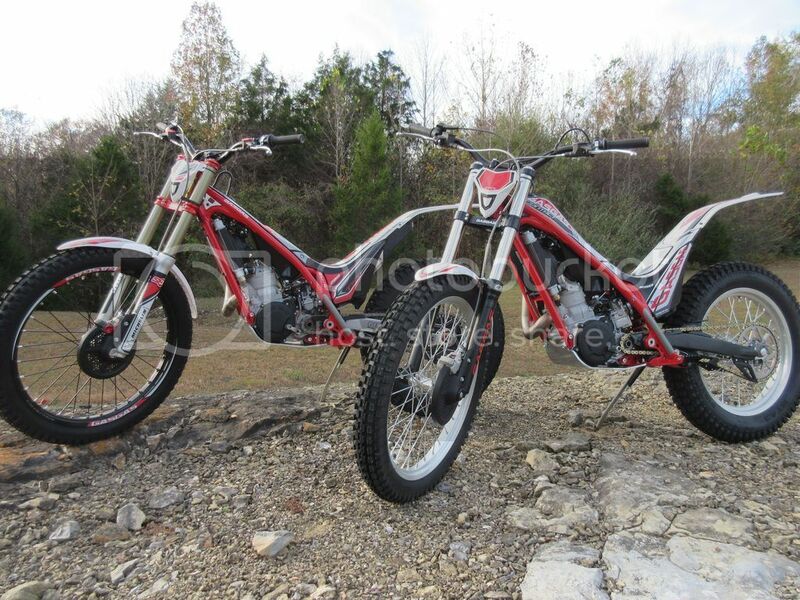 If you're planning on just using a trials bike to help you become a better enduro rider, then why waste $1700.00? Go pick up a Contact and have a blast. At $5999.00 you will get a larger percentage of your money back when you sell it, but my guess is, once you experience trials, you will keep the Contact as a practice bike, then purchase a TXT for competition. Yes, these bikes are that much fun. Plus 1 on the difference Rod you nailed it . My 300 Race will eat you up if you blip it at the wrong time . But it does help me get in shape picking up my bike ! Jeff you are going to love your bike they do however have a starting technique that you will need to learn . I try to find TDC top dead center choke on and then a good kick gets it most of the time . The most it takes me is 3 tries and do not forget to take off the choke . If you take care of it in 5 years it will bring you back $3500. in 10 years $2500. Unlike enduro bike they do not need many extra parts . So enjoy your new bike !